Daniel Stern ("Home Alone") and Matt Frewer ("Eureka") put the cool in Yule in the Hallmark Channel Original Movie, Battle of the Bulbs. The film is about dueling neighbors whose Christmas decorating rivalry turns so outrageous, it puts the "no" in "Noel" for the small town sponsoring the annual fete. Hallmark Channel is the biggest holiday destination in television. 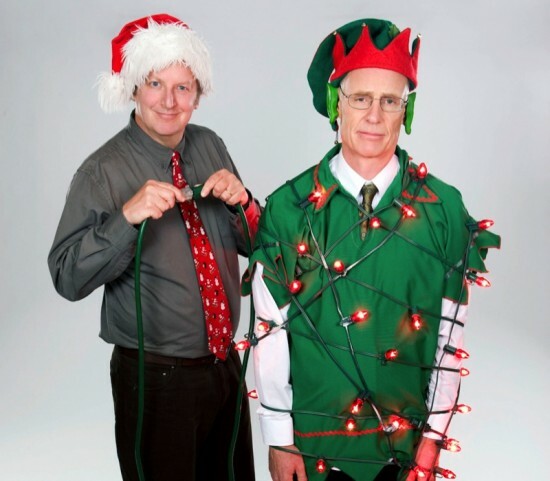 Bob (Stern) and Stu (Frewer) are former best friends whose relationship went sour early in life over a friendly wager. Though decades have passed since the incident, neither man is giving up on the grudge. Imagine Bob's surprise when he discovers his old nemisis Stu is back, has moved into the house across the street, and is taking him on mano y mano (loose translation: How many donkeys should one live nativity scene have?) in a competition to win the town's annual Christmas decorating contest. There is no ornament too flimsy, no filament too thin to keep these two warriors from assaulting each other with laser-like illumination and, finally, merrily melting down the town's electrical systems. But when Stu's son falls in love with Bob's daughter, the two men find exceeding abundantly in life is much more important than exceeding the maximum wattage. "Battle of the Bulbs," is a Brightlight Pictures Production in association with Daniel L. Paulson Productions. Dan Paulson and Shawn Williamson are the executive producers. Jamie Goehring is the producer. Harvey Frost directed from a script by W. Paul Thompson. I like how they say original movie when they already had movies like Deck the Halls, Christmas on Chestnut Street, and The Town that Banned Christmas. Yeah, very original. Of course, ABC Family will do the same thing when they have movies that are just copies of the Christmas Carol. We really had a lot of laughs with this movie,,,,We hope it will be available for purchase soon....It will be a great addition to our collection...thanks for the laughs! Love the movie! I hope it comes to DVD really soon! Deck the halls wasn't the same as this because there was no light competition in that movie. I thought this movie was hilarious...hoping the dvd comes out soon!!! Love this movie. I have been checking for the last two years to see if I could buy it on DVD. Come on people ---I have this taped on my DVR but I'm afraid that I will lose it. It's Feb 10th and I put it on this morning for a laugh. Will this be available anytime soon on DVD - in USA format? This is a great movie; good for laughs. Even Hallmark only seems to show it a couple times each season and usually in the middle of the night or when I'm at work.